Would you trust a doctor who told you to “forget about focussing (sic) on calories, carbs, protein and pH levels, and start focussing (sic) on eating and living right”? Marcus Rothkranz isn’t a doctor, he seems to have no medical background at all. Probably not. Would you trust some guy on YouTube who gave you the above advice? If you value your health, definitely not! But amazingly, lots of people do fall for The Alkaline Myth, a scam being spread by Marcus Rothkranz who publishes videos with questionable “health” advice on YouTube. Since he doesn’t think you should focus on protein, what does Marcus suggest you eat instead of protein? Why, his Wild Force Super Plant Protein mix, of course! An ad for it appears on the very same page where he advises you not to focus on protein. That’s a very good question, because nobody seems to ever heard of him. Marcus has no medical background whatsoever, but that doesn’t stop him from dispensing questionable medical advice. In a video introducing an Orwellian sounding concept called “Epigenetic Birth Control” Marcus claimed that women who “went completely, 100% (sic) raw and cleansed their bodies as clean as they could be, as nature intended, stopped having periods!” Exciting news! But it’s just not true. Marcus claims that his epigenetic birth control will prevent: Periods, PMS, Cramps, Fibroids, pain, low energy depression and is an effective form of birth control. He “discovered” all this without a single medical study. The actual science of epigenetics has nothing to do with reproductive health or birth control. Epigenetics is the study of the effect of non-hereditary factors, such as environmental toxins, on our DNA. Marcus appears to have malappropriated the word so that he could sell his snake oil program with it. Any woman who takes Marcus’ advice about epigenetics is endangering her health, and would likely end up pregnant. 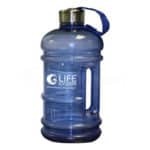 Alkaline water and stomach acid: Marcus is concerned that “alkaline water neutralizes stomach acid” But clinical testing shows that he’s wrong: Drinking alkaline water may raise the pH of the stomach by a pH of about .5 to one for about a half hour. Stomach acid has a pH of about 2, to neutralize it, you’d have to raise the pH of the stomach to 7. Alkaline water is nowhere near powerful enough to neutralize stomach acid, besides, you’re supposed to drink it on an empty stomach. Remember, there is no acid in an empty stomach. False equivalence: Marcus warns of an opportunistic infection by a bacteria called Helicobacter Pylori (H Pylori) which he compares to alkaline water because H. Pylori generates an ammonia compound to neutralize stomach acid. 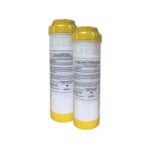 The problem is, Ammonia alkalis are strongly bonded alkalis, they are powerful enough to neutralize stomach acid. The alkaline hydroxide minerals in alkaline water are weakly bonded alkalis, no where near powerful enough to neutralize stomach acid. This has been confirmed in clinical testing done in Japan. Does pH matter or doesn’t it? After warning people not to drink alkaline water because he thinks it can cause health problems, Marcus advises you to forget about pH, because he says it doesn’t matter! So on one hand, Marcus advises you to avoid alkaline water because it will affect your pH, but on the other hand he says don’t bother with it because it can’t affect your pH. Marcus does think water ionizers have a “place” but even here he’s wrong. 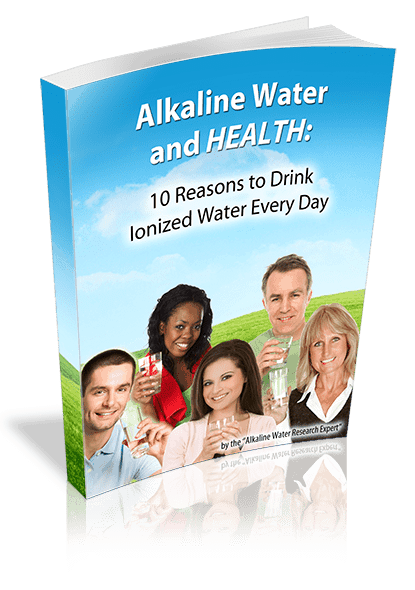 He states that the ionized acidic water from a water ionizer is used for disinfection. He’s wrong, dangerously wrong. Ionized acidic water is good for cleaning surfaces, but it’s not a disinfectant. He suggests that it’s useful for disinfecting vegetables – wrong again. He also claims it’s useful for washing clothes – untrue. What has Marcus confused is that there are batch water ionizers that make chlorinated ionized water for disinfection. These machines use salt, and liberate the chloride ion from salt to make hypochlorous compounds. 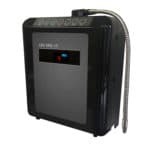 Those hypochlorous compounds are powerful disinfectants, but drinking water ionizers do not make them. 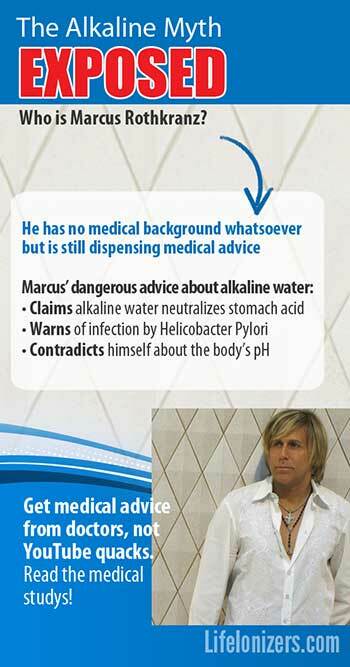 Do not heed Marcus’ advice about ionized acidic water, you could expose yourself to a harmful infection. Quacks like Marcus Rothkranz and Joseph Mercola are the worst kind of scammers. They are giving people medical advice for profit that endangers the lives of anyone who follows it. Women who heed Marcus’s advice on epigenetics may end up putting off necessary medical treatment for serious diseases, and they very easily could end up with an unwanted pregnancy. Men, thankfully Marcus has a lot less advice for, according to his article he considers men to be “filthy”. Don’t risk your life by listening to a quack: Insist on seeing medical studies any time someone – including me – makes a health claim. You can see the studies I based my statement about the effect of alkaline water on stomach acid in the references section below this article. If you are concerned that you may have a health condition, go see your doctor. And remember, You Tube health gurus like Marcus aren’t doing this out of the kindness of their hearts, they have something to sell you.